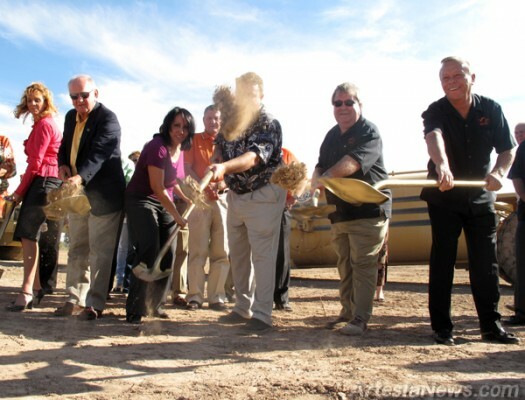 The Trilogy Housing Development, “Artesia’s first and only master-planned community,” broke ground on Friday afternoon to cheers from city administrators and members of Artesia Chamber of Commerce. “We are doing things in this subdivision that have never been done before in this town,” said Trilogy executive Tom DuBose. The development is situated on approximately 56 acres of land located near the northwest boundary of the city and the south edge of Artesia Country Club. DuBose and his partner, Bill Thomas, plan to erect a total of 248 houses divided into four types —Traditions, Estates, Masters and Greens — each serving a demographic niche. Initially, DuBose plans to construct 77 “Traditions” homes, which will range between 1,469- and 2,000-square-feet, and will include up to four bedrooms and three bathrooms. Dubose expects the first model to be completed by March or April. The specific style will sell for approximately $180,000. … For the rest of the story, subscribe in print and on the web.